Home / What is a stroke? Strokes are one of the principal health problems in our country, the consequences can be fatal and they are the primary cause of disability in adults. Few really know what they consist of and how rehabilitation can help to alleviate the effects. Health in Spain is marked by strokes, a condition related to cerebral blood circulation that one in six citizens of this country will suffer from at some point in their life. The figures demonstrate the relevance of this illness which is responsible for the second highest cause of death in our country and affects the main functions of a human being. Good rehabilitation and prevention measures greatly alleviate the effects of this neurological illness. A Stroke is a problem involving blood vessels in the brain which could be compared to a heart attack. A person suffers from a stroke when there are problems with blood flow, generally due to an obstruction or sometimes a haemorrhage. This problem with blood flow to the brain affects functions depending on the part of the brain where the obstruction or haemorrhage occurs. A stroke is not a single condition but a combination of several related factors which, together, affect the blood vessels. They are also known as cerebrovascular accidents, abbreviated as CVA. The patient suffers from a blood clot (an embolus) which obstructs an artery in the brain, this blood clot in many cases forms in the heart and arrives through blood circulation to the brain causing cerebral infarction. The rupturing of a blood vessel produces haemorrhages. Of the approximate 130,000 people affected each year by the illness, one third suffer consequences such as a reduction in motor strength on one side of the body, cognitive deterioration, aphasia or depression. An adult who has suffered from a stroke can suffer from disability or significant changes in their quality of life. To alleviate these effects and for the patient to recuperate their capacities as much as possible, rehabilitation will be necessary. 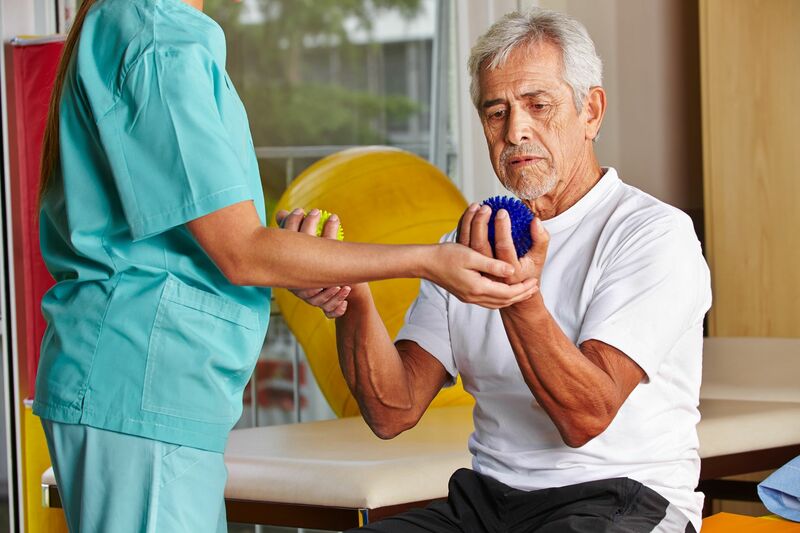 Neurorehabilitation will be fundamental in the recuperation of a patient that has suffered from a stroke. The Casaverde Hospitals have special rehabilitation units and currently set an example in our country amongst neurology rehabilitation centres. Moreover, they carry out physical and cardiac rehabilitation, and special care to treat the effects caused by illnesses such as strokes which can affect any function of the human body. Your browser do not support embed video. Thanks to neural rehabilitation patients with neurological damage can minimise the functional changes suffered or compensate for them, taking back part of their independence and quality of life. Rehabilitation is the only opportunity for those who have suffered cerebrovascular accidents; and their evolution will partly depend on the severity of the illness. The process of rehabilitation for stroke patients consists of various phases and is a multidisciplinary task involving a range of professionals from the health care field who each treat functional alterations suffered by the patient. The neurological rehabilitation centres, such as those at the Casaverde Hospitals, include neurologists, rehabilitation doctors, general doctors and internists, neurophysiologists, physiotherapists, occupational therapists, speech therapists, social workers, nurses and assistants. Good medical attention, with the best professionals, together with the will of the patient, will achieve maximum independence for the person that has suffered cerebral damage, in some cases achieving almost full recuperation of functions. Neural rehabilitation requires much patience on the part of the patient but the results provide a huge improvement in quality of life, an essential process in our society facing an increase in cases of these illnesses, illnesses which must be prevented with a healthy lifestyle.